After enabling monitoring on a machine, Mist.io provides some default metrics to monitor the server's health - cpu, ram, disk, network, etc. Additionally you can add extra plugins from the long list of collectd plugins that exist. However, you may need to add a custom metric, to graph (and set alerts) on something more specific, eg the result of a query in your database. In this example we will create a custom metric to monitor that a site contains a text string, but you could choose to monitor virtually anything. We are going to create a custom metric to check that a site - redmine.engagemedia.org - loads and the page body contains a specific text string. The monitoring graph that will appear on Mist.io will show the time it takes for the page to be loaded, or in case that the site is inaccessible or the text is not contained in the response, it will display negative values. We can also set a rule to get alerted in such a case. and press deploy. This will check if http://mysite.org is accessible, and if a specific text string appears there. Key things on the custom scripts to remember: scripts should be written in python, so make sure indentation is ok otherwise they will fail to be deployed and run. 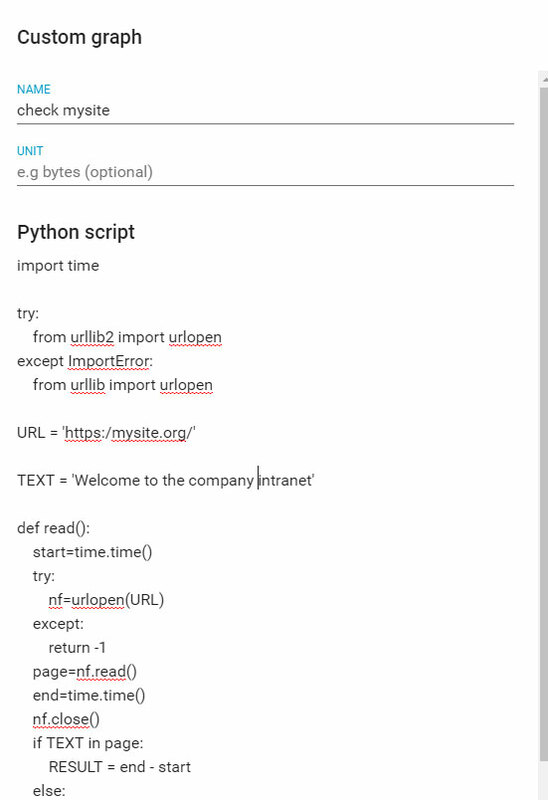 What Mist.io regards as the output of the script is what read() returns, so make sure this exists and returns what you would like to be monitored. We can add a rule, by clicking on 'Add rule' and selecting our newly added metric, and get notified if e.g. the value drops below 0. Create folder /opt/mistio-collectd/plugins/mist-python/, edit file /opt/mistio-collectd/plugins/mist-python/include.conf and insert the name of the metric - in this case it will be check_mysite_org. Make sure the name does not contain spaces or special characters, but only letters. and in a few seconds you should see the graph appear on the machine's page on Mist.io. python plugin: Error importing module "redis_memusage". collectd: Initialization complete, entering read-loop. here we get informed that the plugin /opt/mistio-collectd/plugins/mist-python/redis_memusage.py fails due to a python related issue (missing a lib) so we can fix the issue - in this case make sure this lib is installed.